The Senate added a new article to the bylaws requiring clubs to have a faculty or staff consultant. The Union Senate voted unanimously on Sunday to pass a bylaw requiring each secured club to have a “club consultant”: a University faculty or staff member in an advisory role. The bylaw was formally presented by Senator-At-Large Noah Nguyen ’21 and Vice President Aaron Finkel ’19 at the March 24 Senate meeting. Before then, the amendment had been met with opposition from several clubs and had gone through multiple revisions in response to those concerns. After being passed, the bylaw became section 13 of article VIII of the Union Bylaws. The bylaw begins by justifying the need for clubs to have faculty advisors. In a series of “whereas” clauses, it states that most peer universities employ a similar system, and claims that club leaders have “suffered from a lack of institutional knowledge and more guided experience” and that the Brandeis community “reports a lack of connection” between students and faculty. Per section 13, many members of the Brandeis community, including club leaders, have requested a faculty club advising system. The bylaw justifies its focus on secured clubs — clubs with benchmark funding written into the Union Constitution — by asserting that these clubs occupy the most physical space or receive the most Union funding of any student clubs, have the largest membership and enter into more contracts than other clubs. Section 13 requires all secured clubs to “register a club consultant” with the Department of Student Activities and the Club Support Committee. The bylaw states that all club leaders will stipulate the roles and responsibilities of their advisor in a formal contract, though it does not lay out the process for creating that contract. In these contracts, club leaders can lay out responsibilities for their advisors. The bylaw suggests a few: advising clubs on intragroup or intergroup conflicts, helping clubs self-advocate to the administration, providing third-party feedback on club events and operations and networking with other organizations. Club treasurers and advisors must meet at least twice a semester to ensure the club is acting consistently with “financial policies,” per section 13. The section does not specify whether this refers to University policies or Union policies, nor does it lay out a process for training advisors in the aforementioned policies. Section 13 also does not specify the mechanism for choosing an advisor or any process by which that advisor could be approved or removed. It also does not specify a training process for advisors, nor describe support they might receive. Section 13 was brought to a vote in Sunday’s Senate meeting. Representatives from the Brandeis Media Coalition, including WBRS 100.1 FM and Justice club leaders, were in attendance. Isaac Zukin ’19, one of the general managers of WBRS, was the first to speak. He voiced his opposition to the proposed bylaw. “The requirement to have a club consultant for independent media organizations is a problem,” he said. He called the bylaw an “existential threat to our organizations.” Zukin said the coalition was concerned with the image that having a staff or faculty advisor would convey to the public. He said that access to sources would be harder if the public knew the club had a direct connection to the University. He suggested that the Senate add a “Financial Consultant” position as a substitute for campus media organizations. The “Financial Consultant” would specifically only have a role as a financial guide, unless the media organizations chose otherwise. Former Senator Tal Richtman ’19 commented that the Club Support Committee had been working on the amendment — the new bylaw — for almost three years. 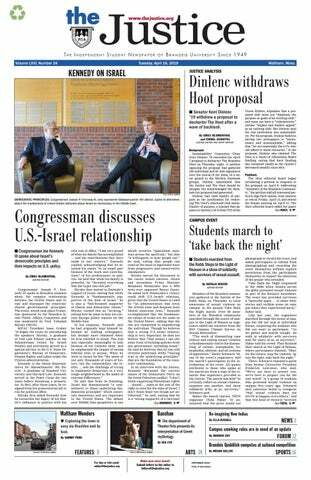 He and Executive Senator Kent Dinlenc ’19 questioned why the Brandeis Media Coalition was raising concerns about the bylaw now, given that the bylaw had been publicly discussed for at least a year. Richtman was on the Club Support Committee when the proposal for Club Advisors surfaced last year. At the same meeting, Natalia Wiater ’20, managing editor of the Justice, highlighted concerns that the public could try to influence the newspaper’s news coverage through their club advisor. Off-Campus Senator Jacob Diaz ’20 said that until the bylaw was tested, the specific concern could not be taken into account. “Currently this is just a concern; until it happens, you can’t realistically say this is a pressing issue,” Diaz said. Wiater replied that the issue had already come up: “Four weeks ago we received an email asking us to take an article down, and they specifically asked for a club advisor [to talk to],” she said. The Senate unanimously called for an executive session, which expelled all non-Senate personnel from the room and lasted around 35 minutes. After the session, the Senate showed the assembled crowd the newly-added clause "(e),” which established that leaders would specify their advisors’ roles in a contract. It remains unclear what the Senate intended by the final clause of the bylaw proposed during the meeting. Responding to a question by Wiater about advisor titles, Finkel said he “personally [doesn’t] care” what the organizations call the position in their contracts with their advisor. Just before a motion to vote, Zukin cut in, saying, “Would calling [the position] a “financial consultant” fall within the constraints of this bylaw? Can I get a yes or no? Can I officially call this, for my club, a “financial consultant” in my contract and it will be reflected officially as a financial consultant?” He received a chorus of “no”s to that question from senators. Section 13 has been shaped and edited over the past month. On March 7, the Justice received a copy of a proposed amendment to the bylaws entitled “Club Advisor Project.” The document detailed the roles and responsibilities of a club advisor under the proposed system. These included working as a liaison between the club and the University, helping the club solve group conflicts and helping with club finances. The March 7 draft also required club leadership to meet with their advisor once a month. Part of the club advisor’s job would be to tell club leaders whether or not the club’s events and goals were “in alignment” with University policy. The club advisor would also “facilitate transitions in leadership to help the sustainability of the club,” according to the March 7 document. The document asserted that club advisors should not be voting members of the club, and that club leaders would hold final say on all club matters. The footer of the document directed questions or concerns to the Department of Student Activities. On March 16, the Justice received a new draft of the proposal, entitled “Club Advisor Project - Draft,” which deleted much of the language in the first proposal. The requirement to meet with an advisor once a month was replaced by a “recommendation” to meet with the club advisor once a semester. The frequency of the meetings would now be up to the club. Club treasurers, however, would now be required to meet with the advisor twice a semester to “ensure consistency with treasury policies,” according to the March 16 document. The document added a formal set of best practices for the advisor, which included respecting the “autonomy of club leaders in decision making,” and “student space.” That clause also allowed for clubs to request that the Union remove and replace their advisor. On March 24, the club advisor project was presented to the Senate as a formal bylaw, entitled “Amendment to Require Club Consultants for All Secured Clubs.” At this point, the language in the documents began referring to the advisors as “consultants.” This March 24 bylaw, crucially, only applied to secured clubs — a significant break from previous drafts, which referred to all clubs. The vast majority of the language in the previous proposals was deleted from the bylaw; early versions had discussed advisors’ roles and responsibilities at much greater length and with a wider scope. The March 24 draft also began referring to the proposal as “section 13,” making it a proposed bylaw rather than a project. The document contained the “whereas” justifications detailed above. It did not contain any language on advisor removal or best practices, or the expectation for club leadership to meet with the advisor once a semester. The March 24 document did not alter the March 16 document’s requirement that club treasurers meet with their advisor twice per semester, and kept the allowance for additional meeting at the club’s discretion. In a series of interviews with the Justice, Finkel discussed ideas that did not make it into section 13 and explained ways they may be implemented in the future. Many of these ideas were in the proposals received by the Justice on March 7 and March 16. Both proposals laid out advisors’ responsibilities extensively and mentioned programming for advisors to “improve their responsibility of possessing institutional knowledge,” per the March 7 proposal. Additionally, both discussed advisor training sessions which would be run by the Department of Student Activities, Treasury training sessions to be run by the Union and “optional Committee brown-bag lunches” to discuss practices with fellow advisors. The March 16 version also added formal “best practices” for club advisors. The March 16 proposal stipulated that if those practices are not followed, “the club bring a request to the Student Union for Advisor removal and replacement.” The March 16 proposal is the only one that mentioned advisor removal, and was the last version to mandate advisors for all clubs, rather than just secured ones. Section 13 has no language about advisor removal or best practices. Instead, some advice on “how to not overstep boundaries as an advisor” will be included in a guide the Club Support Committee is writing for faculty advisors, per a Justice interview with Finkel yesterday. Finkel added that clubs and their advisors will enter into contracts that clearly spell out expectations for the advisor. “Club leaders will be able to dictate … what they want their advisor to do and not to do. … It is up to clubs to decide whether their advisor is meeting their needs,” he said. The Justice asked Finkel how the bylaw would build community between faculty and staff, a goal stressed in the March 24 and 31 drafts, while only requiring twice-semesterly meetings between club advisors and treasurers. Finkel clarified that while only treasurers are required to meet with advisors, “that is not the intent of the program to begin with.” He added, “that is the only thing that’s required.” Finkel said he hopes that club/advisor relationships will develop beyond financial consulting, he said. Section 13 states that club advisors shall “ensure consistency with financial policies.” When asked on April 1 which financial policies the language refers to — the Union’s or the University’s — Finkel told the Justice that both are included in the advisor’s scope. Consultants will inform students about new University rules, but will also receive training on Allocations Board and Union funding policies. Finkel said that faculty advisors will be “required … to attend Treasury trainings, … and will have an advisor orientation at the beginning of next year.” Despite saying these trainings would be “required,” Finkel acknowledged that faculty “are busy,” saying advisors would merely be “encouraged” to attend these sessions. The Club Support Committee’s guide for club advisors — a work in progress as of yesterday’s interview — will also provide insight. When asked if graduate students who teach undergraduate classes could serve as advisors, Finkel was unsure. He said that they “would like” advisors to work full-time, but acknowledged that section 13 does not require this. Asked if undergraduate student teaching assistants could serve as advisors, Finkel said the Union had not intended for students to be advisors, but acknowledged that the bylaw “does not specify that.” As section 13 is currently phrased, any University staff, including student employees, can serve as advisors. Discussing confidentiality between clubs and their advisors in yesterday’s interview, Finkel said he “would not expect a conversation with an advisor to be confidential in all manners,” but that contracts could specify this on a club-by-club basis. Secured clubs that do not attain or maintain a faculty advisor will be at risk of losing club funding or being disbanded. Though not mentioned in section 13, this is standard procedure for a secured club in violation of the Union Bylaws. Prof. Daniel Breen (LGLS) would “welcome the chance” to take on that commitment. In a March 26 email to the Justice, Breen said he is excited at the prospect of “acting as a resource” for student organizations and serving as an advisor. Per Breen’s email, “a lot of people” are interested in integrating faculty into student life, especially if they could advise clubs related to their area of interest. In the interview, Farrelly pointed out that despite advisors lacking formal authority, “there may be a tendency among some … [students] to defer to whatever an advisor says … because of a perception that with title comes wisdom.” Farrelly said she doubts that all advisors will be able to protect students from signing confusing contracts, saying it is “assuming a degree of competency” on part of the faculty, who may not understand the language either. She suggested that an arrangement be made between clubs and authorities well-versed in contract law — not with just any faculty member. Farrelly stressed that she both does not feel competent to serve as an advisor given her lack of legal expertise, and would be unwilling to even if she were capable. The bylaw “did not convince [her] that it is necessary,” she said. The Justice reached out to seven of the ten secured clubs on campus which would be affected by the bylaw. Some expressed support for the general idea of club advisors. Waltham Group President Matthew Nadler ’20 said in a March 19 email to the Justice, “The staff’s support and guidance are essential to our success as an organization and towards us accomplishing our mission.” Nadler said Waltham Group already has a full-time staff advisor. Additionally, he said the club has a team of other supporting staff members, and a partnership with the Department of Community Service. As such, Nadler said he does not expect the passage of the bylaw to have an effect on the club’s operation. Director of Brandeis University Medical Corps Benjamin Merker ’19 expressed similar sentiments, writing in a March 18 email to the Justice that the club has three staff advisors. Other clubs disagreed strongly. At the Senate meeting, Zukin represented the Brandeis Media Coalition — a group formed in response to the Union’s proposal consisting of the Justice, WBRS, The Brandeis Hoot and Brandeis Television — in expressing concerns over the various iterations of the proposal and bylaw. Zukin and Matthew Schecter '19, WBRS' other general manager, further criticized the proposal on behalf of WBRS in a March 19 interview with the Justice. They said that having an advisor would impinge on the independence of campus media organizations by altering their editorial judgement, regardless of whether the advisor were a voting member of the club or not. Zukin and Schecter also emphasized that the optics of having a club advisor connected to the University could harm the reputation of their club. They added that having a University staff or faculty member as an advisor could undermine future content by scaring away potential WBRS interviewees and sources. A major concern for the Coalition was the name of the position; they argued that calling the advisor an “advisor” or “club consultant” could send the wrong message about the editorial independence of the club. On multiple occasions, the WBRS general managers expressed that they felt their concerns about what to name the advisors were being brushed off. In an interview on March 29, Schecter got straight to the point about the struggle over what to call the new position: “They [the Union] see our issue as a semantic issue; … the Brandeis Media Coalition sees it as an issue of cognitive liberty,” he said. By March 29, WBRS had proposed another solution to the Union: creating a position titled “financial consultant,” whose only official purpose would be to advise the club on financial matters. Even this was not ideal, they said. “Let me be clear, this is a compromise. … It is a far, far, far better solution than a club advisor,” Zukin said. Their proposed language was not included in the final March 31 bylaw. No version of the bylaw contained language allowing a club to opt out of the advisor requirement, but the WBRS managers said that including such a clause would make all the difference: “If there was an opt-out clause, we would be fine with it,” said Zukin. Both Zukin and Schecter also expressed frustration at their treatment by the Union during the lawmaking process. Zukin said the WBRS executive board tried to speak with individual senators about their concerns with the bylaw. The senators were not at their scheduled office hours “75 percent” of the times their executive board tried to drop in, according to Zukin. “I’m not happy about the way the process was run. It’s just such a shame that this decision was come to without allowing us to sit down with every one of them,” Zukin said. Zukin said that WBRS did not want to fight with the Union, but felt that it needed to put up a struggle for the sake of the station. “We respect them, many of them are our friends. This isn’t fun for us. We just need to do what’s right for our club,” he said. The flowchart below follows the evolution of this bylaw. Help with the club’s finances if necessary. — Club leadership must meet with their advisor at least once a month. — The footer of the document directed questions or concerns to the Department of Student Activities. REPLACED with a recommendation for club leaders to meet with their advisor at least once a semester. ADDED meetings to make sure club activities “align with [the club’s] ... Constitution,” instead of being “in alignment” with University policy. ADDED requirement for the club Treasurer to meet with the Club Advisor twice a semester. ADDED a way to remove and replace Club Advisors that violate best the practices. REMOVED most language on Advisor responsibilities, including facilitating leadership transitions. REMOVED the process to remove and replace an Advisor. REMOVED the section on best practices. CHANGED the scope from all clubs to only secured clubs. During an executive session of the Senate, one final clause was added to Section 13. —Editor’s Note: Jocelyn Gould, Jen Geller and Natalia Wiater spoke at the Senate meeting on behalf of the Justice. They were not involved in the editing of this article.